Blackmagic Forum • View topic - How to Understand the Usage of Shutter Angle? How to Understand the Usage of Shutter Angle? what is the main use of shutter angle in video? if i am shooting in dim light situation what is best shutter angle? i notice that some lights flicker in some shutter angle, why is that? does it contribute that my video is not smooth if i use a 45degree or more on the 360degree? i heard that i have to only use 180 degree shutter angle because that is equivalent to 60 shutter speed in canon eos. any info would really be helpful. Re: How to Understand the Usage of Shutter Angle? Ooooook. Well, this is a long answer. Most converts from the DSLR revolution will understand the term in "Shutter Speed" as opposed to Shutter angle like a proper cinema camera like the BMCC does. If you're shooting in narrative film standard "24p" or "23.976p" you'll likely be shooting at 1/48th Shutter speed or the equivalent 180 degrees shutter angle. 24p x 360 / 48 = 180. Doing the math swapping values will give you the reverse effect. 24p x 360 / 180 degrees = 48, or 1/48 of a second. Someone has misinformed you. 180 degrees of shutter is equal to 1/48 shutter speed. But it's close the cinema norm of 1/48 or 180 degrees. Most DSLR's can't shoot exactly at 1/48, and so shooat 1/50 or 1/60. As far as shooting in light is concerned, you generally don't want to adjust your shutter angle to compensate for an abundance/lack of light, as the shutter angle has significant impact on your motion blur, or lack thereof. This is why your 45 angle is giving you a jittery and unsmooth image. 45degrees is 1/192 shutter speed. You'll want to adjust your aperture, iso, and/or filters to adjust the transmission of light onto your sensor. The flickering light effect happens when the Hz discharge generated by the light is not properly in sync with the shutter speed. Namely flourescent lights Which is why understanding your light sources is so important to production. Just to add a side note. Changing the shutter can beneficial in a few situations. I was at a ren fair last weekend and I would change my shutter angle to 45 in order to reduce motion blur on action shots that I wanted to slow down in post. Things like twixtor and AEs pixel motion perform better when there is minimal motion blur. Sometimes it is useful to change the speed to compensate... say if you're shooting a 60hz monitor which you cannot change to 48hz for example. So changing to 1/60 in this situation will stop flicker. innerspark wrote: Ooooook. Well, this is a long answer. Most converts from the DSLR revolution will understand the term in "Shutter Speed" as opposed to Shutter angle like a proper cinema camera like the BMCC does. i usually shoot 30 fps and when i convert the final fps in FPCX i usually make it 1080p 24fps. a 360 degree shutter would be fully open, e.g. no shutter. It would cause all kinds of blur. A smaller angle, e.g. 90 degrees would cause staccato motion-- and was used to good effect in the opening scenes of Saving Private Ryan, for example. 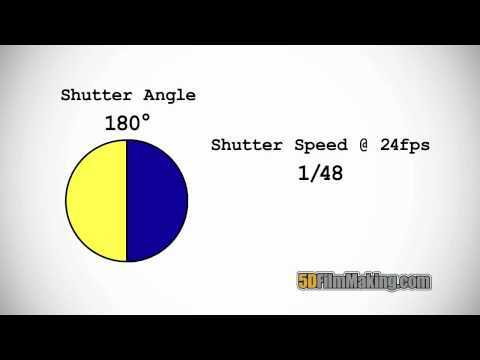 Good explanation between it all here as well as how it relates to DSLR. So if i am using 30fps recording then i should be using a constant 225 degree angle? Furthermore, if i am using canon 5dmk3 at 60fps recording, then i should not use a shutter speed above 120 so it will not give me a jittery image like that of the saving private ryan? Please bear withe here, one more thing, so if i am using 60fps its much better for me to have a 1/30 1/60 or 1/120 shutter speed but not above 1/120 so to eliminate the jittery effect of saving private ryan? CptZero wrote: i usually shoot 30 fps and when i convert the final fps in FPCX i usually make it 1080p 24fps. Not sure why you would do that unless your deliverables are for the web. I believe the web is happy to show 30fps or 24fps but your web viewing monitor may prefer 30fps. If your final deliverable is truly 24fps, you should shoot in 24fps. If your final deliverables are broadcast or shown on NTSC devices, you want to shoot 23.976 (23.98 on the menu). I believe there has been discussion on the Red forum recommending 23.976 even if you may produce 24fps deliverables. If you shot 30fps, but wanted the appearance of a 180 degree shutter angle on your 24fps deliverable, you would want to increase the shooting shutter angle to 225 degrees if that option is available. It's always 180 degrees to get that smooth motion no matter what fps on the bmcc. In a dslr basically times it by 2, so 24-25fps would be 1/50, 30 1/60, 60 1/120. 180 degrees is half a circle so if your frame rate is 30 then imagine thats the value of your half a circle. 30 x 2, etc. For reference, I believe the following info is mostly accurate. Great, thanks a lot, Peter! How about shooting timelapse ? I want to create blurry effect to the moving objects. in DSLR we can achieve that by open wide or bulb the shutter speed. Then i applied it to BMCC, i shot timelapse and set my shutter angle at 360degree and 10frames /s. i couldn't achieve that blurry moving object. Anyone can explain this? Rudy Satria wrote: How about shooting timelapse ? I want to create blurry effect to the moving objects. in DSLR we can achieve that by open wide or bulb the shutter speed. Then i applied it to BMCC, i shot timelapse and set my shutter angle at 360degree and 10frames /s. i couldn't achieve that blurry moving object. Anyone can explain this? Yes i did that. Thats the most open wide on 360 equal to 1/24 right? i need more than that to get the blurry effect to the moving objects. It's not possible with this camera rsp. this firmware, it doesn't support longer shutter open times. Mac Jaeger wrote: It's not possible with this camera rsp. this firmware, it doesn't support longer shutter open times. hmm i see. thanks Mac. I could add that I in some situation shoot 360° to gain one stop. If the scene is calm and there is no sudden movements I find it usable. No problem with blurring. Now ask Tom Cruise or Jamie Foxx to do something while you point the camera at them and record. Hi, I'm an amateur who has never had to deal with shutter angle before. I am getting MASSIVE amounts of motion blur, or "ghosting" on my BMPCC footage. I am shooting dance, which is a lot of fast movement, so I thought I should be shooting more frames per second to capture that movement. Though maybe I'm wrong. I'm currently using 30fps at a 172.8 shutter angle in the film setting. The ISO stays at 800ASA, and the white balance is always 4500. It looks terrible whether I'm shooting spotlight performances or outdoors. Can someone please help me with the ideal settings for fast motion capture? I'm usually locked down, but I also do hand held from time to time. Is converting from 30 frames down to 24 doing this? I thought shooting more frames and converting to less frames would make things smoother and clearer, but maybe my logic is off. for BMPCC modern dance stuffs! Shooting higher frame rates won't fix your blur issue. Generally speaking you should shoot at the frame rate you plan to deliver your final film in. You would only shoot hight or lower frame rates for a creative or technical reason. Like slow motion or to speed up the action. To get less motion blur you need the shutter open for a shorter time. Think of the shutter as a clock. One full turn around the clock is the time each frame sits in the gate. The shutter is open part or all of that time. 360° is on full rotation of the clock. So the shutter is open the whole time. Lots of light gets in and lots of motion blur is seen in the movement. Shooting 25fps this would be 1/25sec shutter speed. 180° is open only half of that time. Less light in and less motion blur. 1/50th of a sec at 25p. 45° is just a quarter of the time. (Edit - 90° is a quarter, thanks Rick for spotting my typo) Much less light in and almost no motion blur. 1/100th of a sec at 25p. You can probably work out the rest. Shoot some tests. Experiment. There is no "perfect" combination. Only one that is right for you and your needs. Last edited by adamroberts on Thu Apr 24, 2014 5:05 am, edited 1 time in total. adamroberts wrote: Shooting higher frame rates won't fix your blur issue. Generally speaking you should shoot at the frame rate you plan to deliver your final film in. You would only shoot hight or lower frame rates for a creative or technical reason. Like slow motion or to speed up the action. 45° is just a quarter of the time. Much less light in and almost no motion blur. 1/100th of a sec at 25p. Helped my understanding a lot. Adam, I'm sure you meant to say 90 degrees is one quarter or 1/100th of a second and 45 degrees is one eighth and 1/200th of a second assuming 25 fps. Oops Sorry... Yes Rick, you are correct. Was typing on my phone while on a busy train. Shutter angle controls the amount of motion blur, like rick and adam pointed out. It's just the opposite of "shutter speed" that you sometimes find on consumer cameras or may be used to from photography. Don't go too low on your shutter angle, or you will get choppy looking motion. You are shooting progressive, so you only have 30 images per second, which is almost slow enough for our eyes to see the single images (interlaced TV shows 60 images per second, that's why motion looks fluid there). To retain the illusion of smooth movement a certain amount of motion blur is actually helpfull, even more so if you shoot at 24 fps. As a rule of thumb (and a reminder of the past, when there were actual mechanical shutters) most people use 180° as a compromise between motion blur and choppy motion, but that may not be the best setting for sports or action filming. Shutter angle also helps to deal with flickering lights under certain circumstances, e.g. when shooting 30 fps in 50 Hz country like most of europe or australia, or when not shooting 30 fps in 60 Hz countries like the us or parts of asia. There's a bunch of threads about that problem... This means, you are not completely free to choose the shutter angle you might deem best with regards to motion blur. Earlier versions of (at least) the pocket camera had a firmware bug which made some 180° settings look like 360°, resulting in much more motion blur than expected. This was fixed months ago, so as long as your firmware is up to date, you must not be worried about that. I just updated the firm ware on my BMCC. I am excited to see a shutter angle of 11.25 is now available. I shoot a lot of surfing and I am keen to see the results. at 30fps this would be 1/960th. If it is too jittery at least I will have a nice sequence of stills. It would be excellent to have 60 fps. Just wondering if anyone has shot anything at this shutter angle? No, the deal with shutter angle is, the camera adjusts the "shutter speed, 1/50th for 25fps) to match the frame rate of the camera. At 25fps 180=1/50th Sec. (2x the fps rate). So at 60fps, you would still use 180-degree shutter for "Cine film motion cadence look", which at 60fps would be a 1/120th of a second, (more of a "video" look) for computing exposure. If your subject does not have much motion, interview talking head, then you could go to the next sower setting, 220-degree to increase the exposure if needed. The shutter angle controls motion look, with 180-degree being "normal", a larger angle (220-degrees) gives more money ion blur, and a smaller angle, 90-degrees (good for fast moving things like sports or a auto race) will give less motion look. The difference between 220, 180 and 90 degrees equals one-half stop increase or decrease in exposure, so,if you used 180-degree 25fps at f/4.0 and you changed the angle to 90-degrees, you would need to open the lens one stop to f/3.5 to keep the same exposure. Same with changing fps from 24/25 to 60fps, you need increase light to sensor by 1-stop. If you slow down the shutter with a larger angle, like 220- degrees, then you need to stop 1/2 stop to compensate the exposure, at 360-degrees, you,gain a fullstop of exposure, useful in low light. Last edited by Denny Smith on Sat Aug 20, 2016 6:11 am, edited 1 time in total. Javier, very very simple = always use 180 degree shutter angle for regular cinematic motion blur. If you want sharp choppy looks, then try 90 degrees. 180 degree isnt a time, its just HALF the frame rate, so whatever you shoot, 180 renders motion blur in a regular cinematic way, and lower angles make the action more and more choppy and stuttery looking, like saving Private Ryan action scenes or gladiator. Also, when you have some kind of flickering in low quality flourescent lights or a tv monitor or something, try neighboring shutter angles to mitigate it. Thats the over simplified answer. Further to Kyle's comment, don't overlook the beauty of shooting with 360 degree shutter angles. You gain a stop of light which is very welcome in a low light situation and it gives a lovely motion blur in some situations. When I say 'blur' that's really something you only notice if you examine a single frame. When you watch your motion picture show, it just can look very nice and your brain somehow knows how to stitch everything together anyway. We have all seen so much footage at 90 degrees or smaller angles, but I've grown to prefer going the other direction with moving subjects. Try some at 270 degrees or 360 degrees. You may like it. Last edited by rick.lang on Sat Aug 20, 2016 6:03 pm, edited 1 time in total. Thanks Peter, I was looking for this.